of some restaurant on the plebian tripadvisor.com web site and even the foodie web sites. But my favorite knowledgeable account of restaurants in Orange County was the person who wrote the following answer to someone's query about where to eat in Orange County: "you don't go to Orange County to eat." Now, that being said, what you can eke out are the names of acceptable places to eat that provide decent or adequate food in a nice environment, but nothing to write home about. I ate at Ocean Brewing in Laguna Beach, California and it was a very fine experience. A nice brew pub producing their own fresh beer and a menu they called Mediterranean-Italian which was, in fact, Italian. A lovely greeting, nice attentive but not overbearing service, and an almost imperceptible transformation from a restaurant to a DJ-run music blasting dance venue around 9:30 pm. 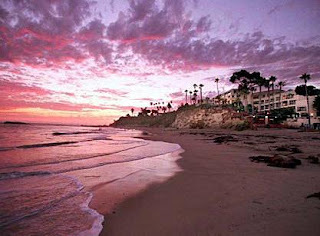 Laguna Beach is an old California beach town with a real artist's colony and a most delightful location. Today it's a heavy tourist destination and has a somewhat crowded and unreal feeling, but still pleasant as a rendezvous. It's filled with restaurants nearly all of which are unmemorable except for locations (many overlook the sea) and sometimes expertly made drinks.